Fitness motivation is vital if you're looking to exercise regularly. 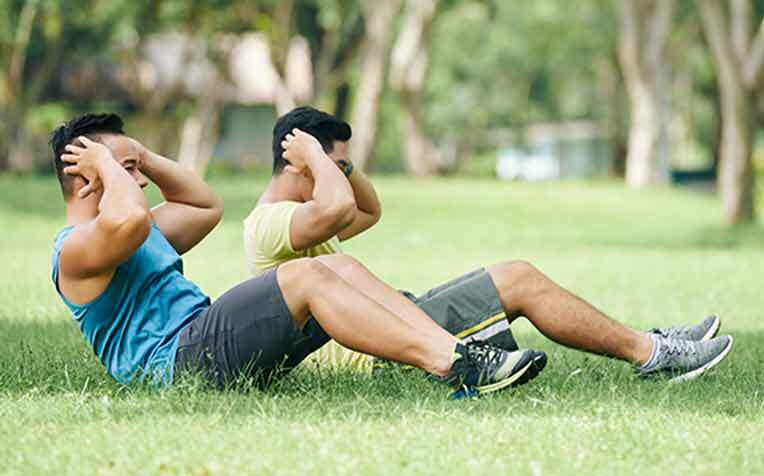 Changi Sports Medicine Centre at Changi General Hospital (CGH) shares useful tips on how to overcome excuses, stay motivated and get the most from your workout. ​like having a friend to exercise with or taking part in an activity that you enjoy can serve as great motivators to exercise regularly. Everyone knows exercising works wonders. The secret is to do it regularly. Changi Sports Medicine Centre at Changi General Hospital (CGH), a member of the SingHealth group, shares tips on how to get motivated and stay motivated. You already know that there are many great benefits from exercise, including higher energy levels, less fatigue, improved sleep and health, and reduced anxiety, stress and depression. But what’s keeping you from exercising regularly? While practical reasons such as a busy schedule, irregular work hours or poor health can make following an exercise plan more challenging, the biggest barrier for most people is all in the mind – lack of selfconfidence that prevents one from taking positive steps, motivation that quickly fades, getting easily discouraged, or giving in to excuses. Step 1: Destroy those excuses! It is all about priorities. You don’t need to spend hours for a good workout. Just short 5-, 10- or 15-minute bursts of activity can make a difference. Physical activity is an effective pick-me-up that reduces fatigue and boosts energy levels in the long run. With regular exercise, you will feel more energised, refreshed and alert. Try to find an activity that you enjoy, such as dancing or swimming. Take a short walk during lunchtime, cycle with a friend during weekends through a scenic park, or listen to your favourite music during a dance workout. For most adults, at least 150 minutes of moderate activity per week is recommended. Try exercising for 30 minutes, five times a week. Can’t find 30 minutes in your busy schedule? It’s okay to break your exercise activity into shorter workouts. Shorter workouts can be just as effective. Consult your doctor first if you have health concerns such as heart disease, asthma, diabetes or high blood pressure. Warm up. Make it a habit to perform stretches or movements that warm and flex your muscles (e.g. leg kicks, walking lunges or arm swings) before any exercise. Cool down. After your workout, it’s important to take a few minutes to cool down and allow your heart rate to return to its resting rate. A light jog or walk after a run also helps prevent soreness and muscle injuries. Listen to your body. Stop working out if you feel pain or discomfort while doing so. If you feel better after a short rest, you may slowly resume your workout. Do not try to power through the pain as it can cause serious injury to your body. Set realistic goals. You don’t have to spend hours in a gym or force yourself into activities you don’t enjoy. Start with a walk around the block. Adding a small amount of physical activity into your weekly schedule can make a positive impact on your mental and emotional health. Be kind to yourself. Don’t beat yourself up when you miss a workout session. Take a break and start fresh the next day. Manage your expectations. Exercise will not transform your body overnight. Focus on consistency instead of obsessing over results. You will be surprised how far you have come in no time. 1. When should an athlete / individual see a sports physician? Visit your doctor immediately if you're having difficulty with everyday activities or if thereʼs swelling in any injured limb. Applying some simple first aid (e.g. R-I-C-E or Rest, Ice, Compress, Elevate) immediately after an injury while waiting to see your doctor will help to minimise the damage. For less severe injuries, the rule of thumb is to observe your condition for two weeks – if the symptoms do not go away, then it is time to see your doctor. 2. How does sports medicine help injured patients return to sports quickly? Accurate diagnosis. We identify your injury through history-taking, physical examinations and diagnostic tools. Eliminating root causes. We identify the root cause of any injury and address it or remove it, if necessary. Thus, the injury is less likely to recur. Intensive rehabilitation. We ensure a good rehabilitation programme, which comprises more than just resting and pain relief, because most injuries require intensive and step-by-step rehabilitation. Established in 2002, CSMC is the largest multidisciplinary sports medicine centre in Singapore. It is equipped with the latest high-tech equipment and an in-house gym. CSMC caters to recreational and competitive athletes from a wide range of sports, and provides exercise testing and customised exercise prescription for those with medical conditions.